Templates management in the LMS is a feature of the premium subscription plan. The Virtual Classroom > Templates menu gives you multiple options for managing the templates you have created within the virtual classrooms you have opened. You can create, edit, delete and share templates within your Learning management system through here. Organisations, Administrators and Teachers can also access the Templates menu by clicking on the File Library in the left side menu. The Templates menu allows you to rename, sort, share and delete templates with other teachers from your Learning Management System. Clicking on the + Create new template button will open a virtual classroom where you can create a template and save it for later use. Pressing the Edit key to the right of the creator’s name will load the chosen template in a virtual classroom where you can make changes to it. Once done, you can save the template in the room. It will then appear in the Templates menu. 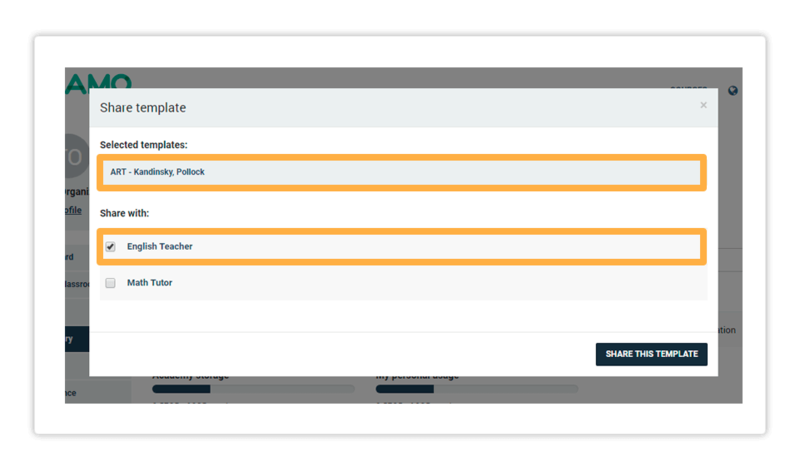 Use the Select teacher filter to view and manage templates created by other teachers. In order to delete unnecessary templates, you should first select them by ticking the box to the left of their name. After pressing delete, the system will prompt you to confirm the action. If you want to use the share functionality, first select the template(s) you want to share. Then press the share button. You will see a new window containing a list of all teachers in your Learning Management System. Click on the tick box to the right of the teacher’s name to select them. Click on Share this template once you have made your selection and the teachers you selected will now also be able to access it through their Templates menu. Next up we can take a look at the Quizzes menu, which allows you to create quizzes for your students and attach them to courses or groups.